Not directly oriented towards development but I have wondered quite a while now if there is any down side of using ISO3200(H-setting) vs ISO1600 and boosting exposure 1 stop(I've found out that it is more close to +0.91 rather than full stop) in Lightroom? I did my own tests and really couldn't find a any difference between two of them. Maybe ISO3200 is very slighty more pleasing, tiny bit less chroma noise and finer grain, but I could be also making that up. I surely thought there is a difference in dynamic range in favor of ISO1600 but absolutely zero diffence. 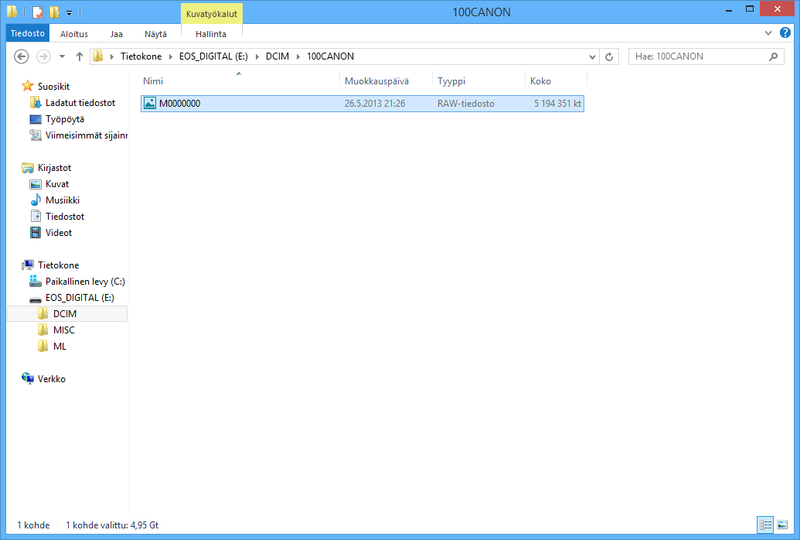 Maybe I'm doing something wrong but I guess I start using H-setting from now on(didn't use extended ISOs before this). I guess that DIGIC II is doing better job than my expensive computer processor and 10 years newer processing algorithms. mv1080(1728x972)10bit would be super awesome! How long recordings(in theory) could you expect in 24/25p? Because in movie mode, the lens aberration only correct the peripheral illumination, chromatic does not. Set higher ISO and NR also affect process speed. Oh I see... I knew I didn't think of something. I bet they even mention about that in Canon's manual. I found out that JPEG buffer is almost unlimited* when shooting stills in video mode. Raw buffer depth is the same. I don't know if this is any useful info for the development but I thought I would share this. E: *I tested this a bit more. It is not quite unlimited as I first though but it's still much better than in photo mode. Buffer depth seems best in 4:3 video mode. I can get around 75 shots(shooting large jpegs) in a row without slowdown after formatting and reboot. After that I can get roughly 25 shot bursts. In 16:9 mode it seems to be slightly worse weirdly(bigger crop). I only have 40 MB/s card though, maybe it is better with faster card. E2: Shooting medium or small size jpegs buffer seems almost unlimited. Got over 150 shots and I stopped myself. Didn't want to ruin my shutter any more. Can you run the display test? 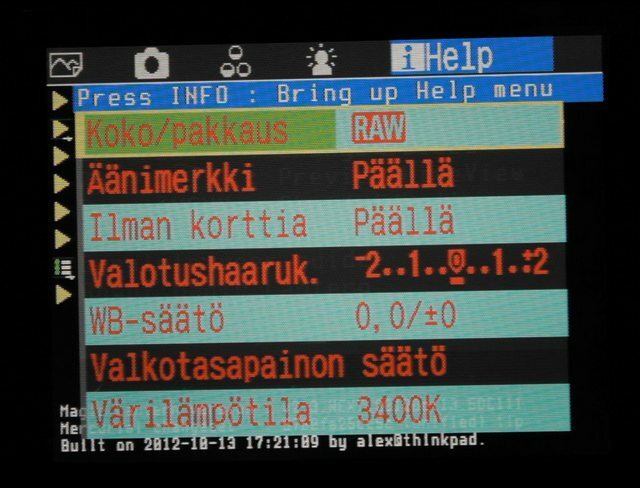 So far, no other 5D user tried it, so we also need somebody with a good camera to confirm the test is actually working. I tried this, hopefully I did it correctly. ps. I think this message should be added to 1st post or make the instructions more clear for dummies like me. I'm always having problems with installing ML to my 5D(led just keeps blinking if I do it by 1st message instructions). That usually does the trick if anyone is having problems also. Is there anyway to use your smartphone as a monitor with your EOS M? I know of the app called "DSLR Controller" but it won't work on EOS M because of Canon have crippled remote functions of M. I was wondering could it somehow work with MHL adapter and MHL enabled phone? If not suggest a reasonable priced "field monitor" for me, mainly to check focus. It should be rather small, under <6" preferably. 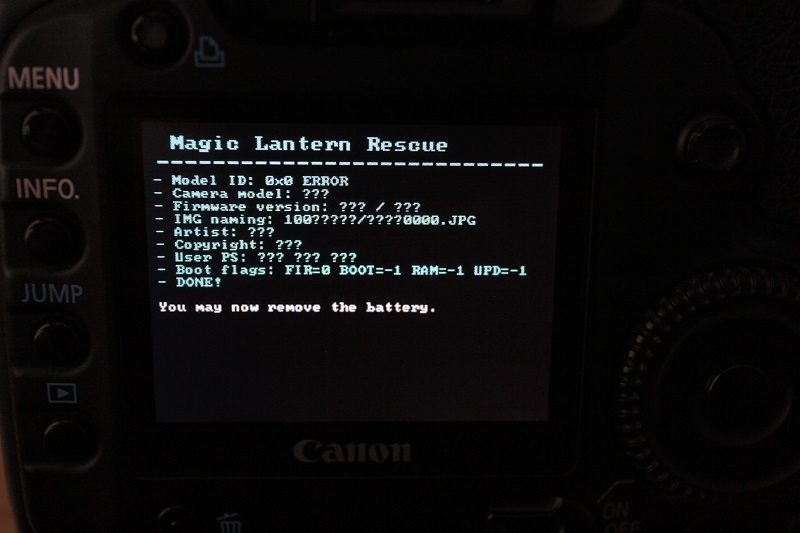 Does anybody know the power requirements of EOS M(or Canon cameras in general)? Canon's AC adapter for EOS M(CA-PS700) outputs 7.4V/2A but is meant for many other camera models as well. And I think there are quite a bit of headroom "just in case". conclusion that around 600mA should be enough. But that is a old camera with no liveview/video functions so that doens't help that much. I'm just thinking that could I get away with only 1A but slighty higher voltage ~8.4V. I'm also looking for external battery solution for my EOS M.
I don't know if could help me since you have build one. and plug it into Canon's original DC coupler for EOS M(Canon DR-E12). The problem is that I don't find anywhere what is the size of that DC plug on that DC coupler so that I could buy adapter for it! Do you know the dimensions of that DC plug which goes to the "dummy battery"? Other thing is that now I'm second guessing if that power bank can deliver enough power. It is rated at 8.4V 1A. Voltage should be fine(fully charged canon battery outputs over 8V) but I don't know if 1A is enough. Thank you very much, I have to give this a try! It is the same. But I dont know is there any new features in later builds. Thought I didn't get the headphone monitoring to work.. I was using the a/v cable which came with 550D. When I plug the cable in the screen just blacks out(it doesnt matter if the setting is on or off), camera is still working though. Maybe it thinks that I'm using external screen? Have anyone got it to work? E: The exact cable what I'm using is Canon AVC-DC400ST, it should be 100% compatible with EOS M.
There are no audio functions. Eos M lacks of audio controls. I don't know but i'm using TL build and there is headphone monitoring. I don't know is it working or not. I bought zoom h1 and now I have proper preamps etc. Where can I download the latest TL build(can you put a direct link to the download)? Is the installation process same as with the ML? I neewbie on this, and today i finally received my canon eos m (still waiting for the 22mm f2 lens), and after a few experiments with a Pentax M 50mm F1.7, i already noticed that i will have a new toy to play with. Already installed ML (5jun14 nightly) andone thing that i would like to ask, is if it is normal that no Audio Functions are available on ML Menu. Besides this, does someone recommend a getting started path do HDLSR and ML? Many thanks, and keep the good work going. Which build includes headphone monitoring? Does it work any good? Tried with latest nightly build, there wasnt that submenu. Btw which one is the most stable release with headphone monitoring and cropvideo? I don't need raw video, too much hassle with pink dot issues and all. ^Yeah, I have found that out. What I meant was; is audio quality really worse on 600d vs. 550d? Does anyone know the answer to my question above? Is the actual audio hardware physically worse than in the 550D? That is kind of hard to believe..
Maybe I have to think again the "upgrade" because I'm so lazy that I usually plug microphone directly to the camera. Sound quality is just about good enough for me with the 550D. I'm also willing to donate some money, if it would help with the development. Sadly I don't have any skills, time(yes i do) or even strengt to continue the project. For some reason I'm not able to get ML running on my 5Dc again. I had it couple of months with any issues but I accidently formatted the card in camera yesterday. I have tried dozens of times to get it running, but I always just get blinking blue light. Is there any possibility to get "shutter delay(MLU)" feature on 5Dc? That would be super helpful, with my 550D I can get almost 1-2 stop longer shutter speed with it. I have noticed an issue while scrolling in ML menus; time to time Canon menu flickers top of ML menu. Has anyone else noticed this? Other than that, this seems to run like a charm. Btw is there anyway to correct that greenish-magenta tint on the screen when you are watching images on playback mode? As we all know the screen on the 5Dc is bad, the resolution is fine(imo), but the colors are way off when comparing to PC monitor. Mostly because of that green-magenta tint on the LCD. I will try to match the scene, DOF, colours etc. best as I can. Why I'm telling this? Because then I have some reason to do this test, other wise I would probably move it tomorrow and then again tomorrow etc. You know what I mean. Now I have social pressure to do this, I can't let you guys down. 2) 10x zoom kills camera, so would be nice to have it disabled by default. Yeah, I have noticed the same. But... how the 4Gb limit problem was solved here ?!?!? 7Gb file ?!? Are you sure ?! ?